Organisers of next month’s Aviva London Grand Prix at Crystal Palace had hoped to stage the first 100 metres head-to-head of the season between Bolt, Tyson Gay and Asafa Powell but the triple Olympic champion is set to shun the meeting because it would expose him to a huge tax bill. Unless the tax rules are relaxed, athletics administrators fear British fans will be denied the chance to see the sport’s biggest star in action again until he returns to the capital in two years’ time to defend his Olympic titles. 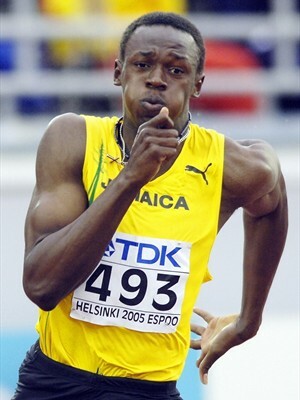 “I wouldn’t be optimistic about seeing Bolt compete on British soil this year and there is a strong chance he won’t be back until 2012,” said an insider close to the negotiations with the Jamaican. Since April, foreign sports stars competing in Britain are liable for a top rate of income tax of 50 per cent but, controversially, the tax is charged not just on the money they earn in Britain but on a proportion of their worldwide sponsorship income. The European Tour, which stages the Ryder Cup in partnership with the United States Professional Golfers’ Association, is among a number of governing bodies concerned that the Inland Revenue’s policy of taxing overseas sports stars in the UK on their global endorsement income is undermining their ability to stage top-quality events. Also lobbying for a change in the law is UK Athletics, the London Marathon and the All England Club, which has concerns that the tax issue has reduced the quality of the field at Wimbledon warm-up events, including Queen’s. The sports this week requested a meeting with sports minister Hugh Robertson to discuss the issue. …Other sportsmen understood to have avoided UK events, in part because of the tax issue, include Roger Federer, who has never played at Queen’s, and Sergio Garcia, who is thought to require a top-three finish at this week’s Open to avoid losing money on his week in Scotland. The European Tour will tell the Government that the tax measures disproportionately affect overseas golfers and are a major reason why UK tournaments, including the Welsh Open played over the Celtic Manor course that will host the Ryder Cup, attract fewer overseas stars. All of which serves to illustrate nicely, once again, that there are producers of wealth and there are plunderers of wealth, and government, by definition, can only ever be the latter. That is crazy – the british claim to be able to tax a non-citizens income if all they do is compete there? Soon people will have flags of convenience, just like ships!! A merchant ship is said to be flying a flag of convenience if it is registered in a country different to that of its owners “for purposes of reducing operating costs or avoiding government regulations”. The closely-related term open registry is used to describe an organization that will register ships owned by foreign entities. I wonder what the tax code is like in Liberia! What are you studying? I would be interested to know. With Regards to money, it is no poison, it is just a representation of our labour – it is a medium of exchange. As Ray puts it in his book Leave Us Alone – Have you read it yet? Money evolved out of the barter system. This is so because trading makes the job of survival incalculably easier. If we did not Paper(fiat)Money as we have it our societies today, we would simply use something else to represent value – the value that we create when we produce. Our current crop of governments have decided that they should have a monopoly on money creation – althought they never asked us if we wanted to trade with worthless pieces of paper, as opposed to something of true value. I have some friends who bring up the concept of the barter system – he is a 3D designer – I asked him how he would trade his work on a computer for litre of milk without some abstract medium of exchange. The barter system co-exists with money – people exchange goods all the time. If we were all farmers, all we would have to trade with each other would be food – and then my rendition of your statment would be true – food would be the poison. Which of course is an oxymoron. So when you hear someone say something like that, or make the suggestion that we should move beyond money, into a system where resources are allocated fairly by a central group, you should be very suspicious. As for the selling of Canadian residency or citizenship, as a Canadian I don’t have a problem with it, in fact I encourage people with financial resources to move here and invest in our country – if they are innovative, wish to invest, create jobs, etc. etc. I am all for it. We let people into our country for all sorts of ridiculous reasons, why shouldn’t their wealth be one of them? In fact at one point Canada had no Income tax, and it was sold as a reason for people to move here – now we are just another mixed economy, with a bloated state siphoning off as much as it can get. I want more capitalists here so they can vote out our taxes! As for the Arizona Immigration Law, I read it, there does not seem to be that much in it to object to. America needs a good guest worker program for low wage earners. What I think is interesting is that the presure on undocumented Mexicans to leave the USA happened at the start of your last great depression. ugh I can’t turn them off! Ray Help! Speaking of England, do you realise that in 1974 they slapped a 98% tax on their top 750 000 earners? An increasing number of the mules seem to me to have become disheartened at the difficulty of creating and keeping enough wealth to live the life envisioned in youthful dreams. And correctly so: building lasting wealth is relatively easy when you keep 90%, but nearly impossible when you keep just 40%. And, if the trend now in motion continues in motion, the productive elements will soon be lucky to keep 30%. While even I can’t foresee things getting as bad as they did in Britain in 1974, when the top 750,000 wage earners were slapped with a tax rate of 98%, the steady build toward more regulations, more government, more tariffs, and more taxes in more sectors of the economy will affect a broader swath of the public and, in so doing, weigh even more heavily on the nation.